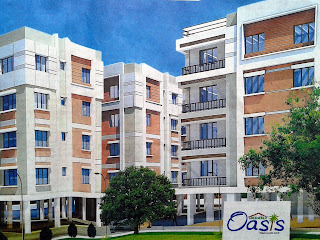 Buy New Flats Kaikhali, Kolkata Loharuka Green Oasis new flat price rate costs charges 1 BHK Flat 2 BHK 3 BHK Flat Rooms size area Green Oasis flats booking online, Kaikhali, Kolkata Green Oasis Buy Flat details of Green Oasis Kaikhali, Kolkata housing project, Property & Real Estate information, 1BHK 2 BHK Flat Size Price & Facilities of Green Oasis Flats in Kaikhali, Kolkata. Green Oasis at Kaikhali, Kolkata has given the opportunity to the people of Kolkata and across Bengal to buy new flat at Kaikhali, Kolkata of Loharuka Real Estate Company. Those who are looking for New Property / Flat / House nearby Kaikhali, Tegharia, Baguiati, Haldiram, VIP Road areas of North Kolkata at cheap price rate; can now contact the head office of Loharuka to book new flat of Green Oasis, Kaikhali, Kolkata. 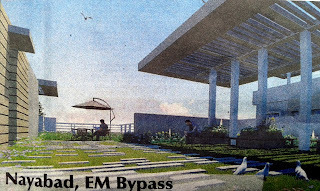 Let’s check out more details on Green Oasis, Kaikhali, Kolkata. • Features Facilities & Advantages of Green Oasis Housing Project, Kaikhali, Kolkata: - Jogging Track, Magazine Booth, Splendid Terrace Garden, Lift Service, Swimming Pool, Lush green landscaped lawn, community hall, gymnasium, children’s play area, CCTV for Security reasons, video door phone for security safety, 24-hours water supply, 24-hours power backups, and many other common facilities are available at Green Oasis, Kaikhali, Kolkata Housing Apartments of Loharuka. • Green Oasis Kaikhali, Kolkata Flat Size, Price / Rate / Costs / Charges: - There are several types of flats are available at Green Oasis like 1-BHK flat, 2-BHK flat, 3-BHK flat etc and the Green Oasis Flat price at Kaikhali, Kolkata are varies depending on the Flat Size. 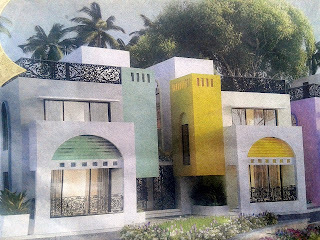 Flat price starts from 34.52 Lacs onwards of Green Oasis Housing Complex of Kaikhali (Kolkata). Finance and Bank Loan facility is available at Green Oasis Housing Project for the buyers. • Green Oasis Housing Project Site Address / Location: - Loharuka Green Oasis Residential Complex is just 1 minute walking distance away from VIP Road, Kaikhali. • Green Oasis Kaikhali, Kolkata Real Estate Project Phone contact number: - 90516-63330 / 98364-19999. • Flat Booking Process at Green Oasis, Kaikhali, Kolkata: - To Book Flat (Apartment) at Green Oasis Residential Complex of Kaikhali (Kolkata) please call 98364-19999 number or email at marketing@loharukagroup.com and for further details please visit www.loharukagroup.com website. 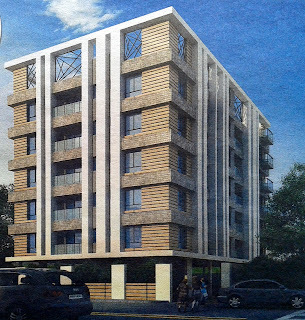 It is recommended to the peoples, who want to buy flats at Kaikhali, Kolkata (or nearby areas like VIP Road, Haldiram, Baguiati, Teghoria, Kaikhali), to contact Loharuka as soon as possible to fill-out new flat booking forms of Green Oasis of Kaikhali, Kolkata or to know whether any discount / offer is going on new Green Oasis flat prices at Kaikhali, Kolkata. 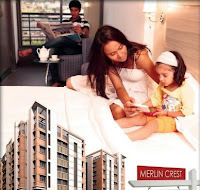 Buy New Flats Madhyamgram, Kolkata Pearl Realty Projects Shivoham Gardenia new flat price rate costs charges 2 BHK 3 BHK Flat Rooms size area Shivoham Gardenia flats booking online, Madhyamgram, Kolkata Shivoham Gardenia Buy Flat details of Shivoham Gardenia Madhyamgram, Kolkata housing project, Property & Real Estate information, 2 BHK Flat Size Price & Facilities of Shivoham Gardenia Flats in Madhyamgram, Kolkata. Shivoham Gardenia at Madhyamgram, Kolkata has given the opportunity to the people of Kolkata and across Bengal to buy new flat at Madhyamgram, Kolkata of Pearl Realty Projects Real Estate Company. Those who are looking for New Property / Flat / House nearby Birati, BT College, Dumdum Airport, Badu Road, Dak Bunglow, Barasat, Hridaypur areas of North Kolkata at cheap price rate; can now contact the head office of Pearl Realty Projects to book new flat of Shivoham Gardenia, Madhyamgram, Kolkata. Let’s check out more details on Shivoham Gardenia, Madhyamgram, Kolkata. Madhyamgram Shivoham Gardenia is a premium Residential project consisting of 52 flats across three G+4 Blocks offering 2-BHK & 3-BHK apartments. • Features Facilities & Advantages of Shivoham Gardenia Housing Project, Madhyamgram, Kolkata: - Jogging Track, Magazine Booth, Lift Service, Swimming Pool, meditation center, badminton court, Lush green landscaped lawn, community hall, gymnasium, children’s play area, CCTV for Security reasons, video door phone for security safety, 24-hours water supply, 24-hours power backups, and many other common facilities are available at Shivoham Gardenia, Madhyamgram, Kolkata Housing Apartments of Pearl Realty Projects. • Shivoham Gardenia Madhyamgram, Kolkata Flat Size, Price / Rate / Costs / Charges: - There are several types of flats are available at Shivoham Gardenia like 2-BHK flat, 3-BHK flat etc and the Shivoham Gardenia Flat price at Madhyamgram, Kolkata are varies depending on the Flat Size. Finance and Bank Home Loan facility is available at Shivoham Gardenia Housing Project for the buyers. 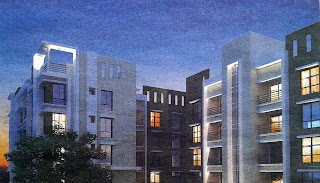 Shivoham Gardenia, Madhyamgram (Kolkata) Flat size – 2BHK [847 sq. ft. onwards] & 3BHK [1106 sq. ft onwards]. Flat / Apartment spot booking at Shivoham Gardenia Housing Complex, Madhyamgram is going on and interested people can book their apartment by paying only Rs.21000/-. Home Loan facility available from ICICI Bank / IDBI Bank / Indiabulls / LIC HFL and cheapest EMI of Rs.15,000/- per month scheme is available to the buyers as well. • Shivoham Gardenia Housing Project Site Address / Location: - Madhyamgram, Jessore Road, Kolkata. Well connected with Bus & train service and future metro railway project. Dumdum Airport (5kms), More Shopping Mall (1.5kms), Julien Day School (1.5kms) Doltala More (500m) and Narayan Hridaylaya Hospital (2.5kms) are not too far from Shivoham Gardenia Residential project of Madhyamgram (Kolkata). • Shivoham Gardenia Madhyamgram, Kolkata Real Estate Project Phone contact number: - 92300-10544 / 85848-32262 / 85848-32264. It is recommended to the peoples, who want to buy flats at Madhyamgram, Kolkata (or nearby areas like Champadali, Dakbunglow, Badu Road, Doltala More, Madhyamgram Chowmatha, BT College, Airport), to contact Pearl Realty Projects as soon as possible to fill-out new flat booking forms of Shivoham Gardenia of Madhyamgram, Kolkata or to know whether any discount / offer is going on new Shivoham Gardenia flat prices at Madhyamgram, Kolkata. Geetanjali Garden Baruipur Kolkata Flat Size Price & Facility Details - Buy New Flats of GS Procorn Pvt. Ltd.
Buy New Flats Baruipur, Kolkata GS Procorn Pvt. Ltd. Geetanjali Garden new flat price rate costs charges 1 BHK Flat 2 BHK 3 BHK Flat Rooms size area Geetanjali Garden flats booking online, Baruipur, Kolkata Geetanjali Garden Buy Flat details of Geetanjali Garden Baruipur, Kolkata housing project, Property & Real Estate information, 1BHK 2 BHK Flat Size Price & Facilities of Geetanjali Garden Flats in Baruipur, Kolkata. Geetanjali Garden at Baruipur, Kolkata has given the opportunity to the people of Kolkata and across Bengal to buy new flat at Baruipur, Kolkata of GS Procorn Pvt. Ltd. Real Estate Company. Those who are looking for New Property / Flat / House nearby Baruipur, Mallickpur, Sonarpur, Narendrapur areas of South Kolkata (South 24-Parganas) at cheap price rate; can now contact the head office of GS Procorn Pvt. Ltd. to book new flat of Geetanjali Garden, Baruipur, Kolkata. 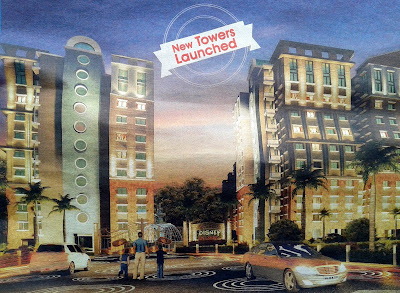 Let’s check out more details on Geetanjali Garden, Baruipur, Kolkata. • Features Facilities & Advantages of Geetanjali Garden Housing Project, Baruipur, Kolkata: - Jogging Track, Lift Service, Swimming Pool, Lush green landscaped lawn, community hall, gymnasium, children’s play area, 24-hours water supply, 24-hours power backups, and many other common facilities are available at Geetanjali Garden, Baruipur, Kolkata Housing Apartments of GS Procorn Pvt. Ltd..
• Geetanjali Garden Baruipur, Kolkata Flat Size, Price / Rate / Costs / Charges: - There are several types of flats are available at Geetanjali Garden like 1-BHK flat, 2-BHK flat, 3-BHK flat etc and the Geetanjali Garden Flat price at Baruipur, Kolkata are varies depending on the Flat Size. Finance and Bank Loan facility is available at Geetanjali Garden Housing Project for the buyers. 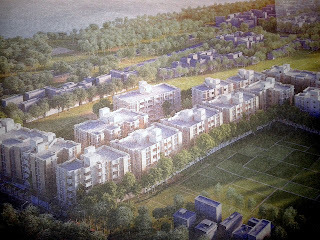 Flat price of Geetanjali Garden Housing project of Baruipur (South 24-Pgs / Kolkata) is only 2200/- per sq. ft.
• Geetanjali Garden Housing Project Site Address / Location: - Geetanjali Garden Residential Complex of Baruipur is located near Padmapukur More. The prime location of Geetanjali Garden Baruipur Housing project is only 1.5Kms from Baruipur Station, 1Km from Bustand and very near to Baruipur College. • Geetanjali Garden Baruipur, Kolkata Real Estate Project Phone contact number: - 8334817171. It is recommended to the peoples, who want to buy flats at Baruipur, Kolkata (or nearby areas like Baruipur, Mallikpur, Hariharpur, Sonarpur, Subhasgram, Narendrapur of extended South Kolkata [24-Parganas (S)]), to contact GS Procorn Pvt. Ltd. as soon as possible to fill-out new flat booking forms of Geetanjali Garden of Baruipur, Kolkata or to know whether any discount / offer is going on new Geetanjali Garden flat prices at Baruipur, Kolkata. 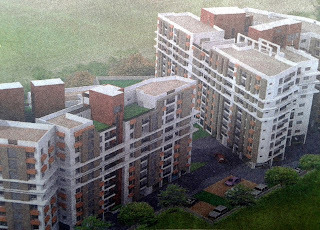 Buy New Flats Barasat, Kolkata Pushpak Pushpakalay new flat price rate costs charges 1 BHK Flat 2 BHK 3 BHK Flat Rooms size area Pushpakalay flats booking online, Barasat, Kolkata Pushpakalay Buy Flat details of Pushpakalay Barasat, Kolkata housing project, Property & Real Estate information, 1BHK 2 BHK Flat Size Price & Facilities of Pushpakalay Flats in Barasat, Kolkata. Pushpakalay at Barasat, Kolkata has given the opportunity to the people of Kolkata and across Bengal to buy new flat at Barasat, Kolkata of Pushpak Real Estate Company. Those who are looking for New Property / Flat / House nearby Madhyamgram, Hridaypur, Barasat Chapadali, Barrackpore-Barasat Road areas of North Kolkata at cheap price rate; can now contact the head office of Pushpak to book new flat of Pushpakalay, Barasat, Kolkata. 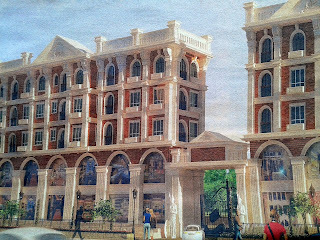 Let’s check out more details on Pushpakalay, Barasat, Kolkata. • Features Facilities & Advantages of Pushpakalay Housing Project, Barasat, Kolkata: - Landscaped Garden, Car Parking, Lift, Swimming Pool, Community Hall, AC Gym, Children’s Play Area, 24-hours water supply, 24-hours power backups, and many other common facilities are available at Pushpakalay, Barasat, Kolkata Housing Apartments of Pushpak. 2BHK Flat Size of Pushpakalay, Barasat Housing Complex is 665-698 sq. 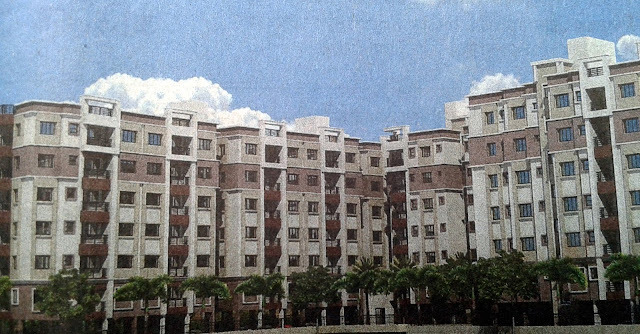 ft.
3BHK Flat Size of Pushpakalay, Barasat Residential Complex is 980-1678 Sq. Ft.
Pushpakalay, Barasat Flat price is only 2423/- per sq. ft. (starting from 16.11 Lakhs). This Housing project Pushpakalay of Barasat is approved by SBI, LIC & Other Banks; so Home Loan facility is also available. • Pushpakalay Barasat, Kolkata Real Estate Project Phone contact number: - 9874879992 / 9874879993. • Pushpak, developer of Pushpakalay Barasat Housing Project, email id: - pushpakproject@gmail.com. It is recommended to the peoples, who want to buy flats at Barasat, Kolkata (or nearby areas like Barasat Chapadali, Dakbunglow, Madhyamgram Badu Road, Barasat Station), to contact Pushpak as soon as possible to fill-out new flat booking forms of Pushpakalay of Barasat, Kolkata or to know whether any discount / offer is going on new Pushpakalay flat prices at Barasat, Kolkata. Mira Garden Madhyamgram Kolkata Flat Size Price & Facility Details - Buy New Flats of Joy Majumdar & Co.
Buy New Flats Madhyamgram, Kolkata Joy Majumdar & Co. Mira Garden new flat price rate costs charges 1 BHK Flat 2 BHK 3 BHK Flat Rooms size area Mira Garden flats booking online, Madhyamgram, Kolkata Mira Garden Buy Flat details of Mira Garden Madhyamgram, Kolkata housing project, Property & Real Estate information, 1BHK 2 BHK Flat Size Price & Facilities of Mira Garden Flats in Madhyamgram, Kolkata. Mira Garden at Madhyamgram, Kolkata has given the opportunity to the people of Kolkata and across Bengal to buy new flat at Madhyamgram, Kolkata of Joy Majumdar & Co. Real Estate Company. Those who are looking for New Property / Flat / House nearby Barasat, Hridaypur, Madhyamgram, Birati, Airport areas of North Kolkata at cheap price rate; can now contact the head office of Joy Majumdar & Co. to book new flat of Mira Garden, Madhyamgram, Kolkata. Let’s check out more details on Mira Garden, Madhyamgram, Kolkata. • Features Facilities & Advantages of Mira Garden Housing Project, Madhyamgram, Kolkata: - Swimming Pool, AC Gymnasium, Landscaped Garden, Community Hall, Lift, 24-hours water supply, 24-hours power backups, and many other common facilities are available at Mira Garden, Madhyamgram, Kolkata Housing Apartments of Joy Majumdar & Co.. Above all, the location benefit because Mira Garden Residential Complex of Madhyamgram is only 12 minutes from Airport and only 10 minutes from Madhyamgram Railway Station. • Mira Garden Madhyamgram, Kolkata Flat Size, Price / Rate / Costs / Charges: - There are several types of flats are available at Mira Garden like 1-BHK flat, 2-BHK flat, 3-BHK flat etc and the Mira Garden Flat price at Madhyamgram, Kolkata are varies depending on the Flat Size. Finance and Bank Loan facility is available at Mira Garden Housing Project for the buyers. 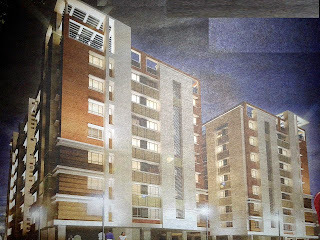 This is the Phase-II project consisting total of 220 Flats [1 / 2 / 3 BHK flats]. 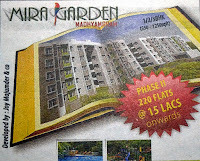 Mira Garden Madhyamgram (Kolkata) Flat size is around 550 sq. ft. to 1250 sq. ft. and flat price starts from 15 Lacs only. 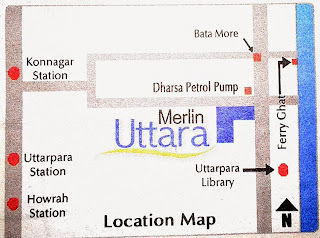 • Mira Garden Housing Project Site Address / Location: - Extremely well located, only 100ft way from Jessore Road at Madhyamgram. 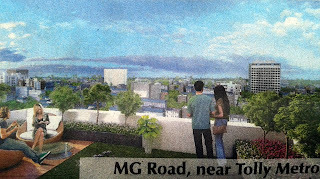 Railway Station, proposed Metro Station and Dumdum Airport are maximum 15 minutes away from Madhyamgram’s Mira Garden Phase-II Residential Housing Complex. • Mira Garden Madhyamgram, Kolkata Real Estate Project Phone contact number: - 92300-10544. • Joy Majumdar & Co. Head Office Address: - 24, Janak Road, 2nd Floor, Kolkata-29. • Joy Majumdar & Co. Head Office Phone Contact Number: - 8584862091. It is recommended to the peoples, who want to buy flats at Madhyamgram, Kolkata (or nearby areas like Barasat Champadali, Dak bungalow, Badu Road, Hridaypur, Birati, BT College, Airport), to contact Joy Majumdar & Co. as soon as possible to fill-out new flat booking forms of Mira Garden of Madhyamgram, Kolkata or to know whether any discount / offer is going on new Mira Garden flat prices at Madhyamgram, Kolkata. Buy New Flats Rajarhat Kolkata G Group Samriddhi new property flat price rate costs charges 1 2 3 BHK Rooms size area Samriddhi flats booking online, Rajarhat Kolkata Samriddhi Buy Flat details of Samriddhi Rajarhat Kolkata housing project. Samriddhi at Rajarhat Kolkata has given the opportunity to the people of Kolkata and across Bengal to buy new flat at Rajarhat Kolkata of G Group Real Estate Company. Those who are looking for New Property / Flat / House nearby New Town, Salt Lake Sector-V, Baguiati areas of Rajarhat (Kolkata) at cheap price rate; can now contact the head office of G Group to book new flat of Samriddhi, Rajarhat Kolkata. 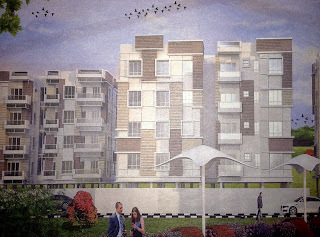 Lift Service, Swimming Pool, Lush green landscaped lawn, community hall, gymnasium, children’s play area, CCTV for Security reasons, video door phone for security safety, 24-hours water supply, 24-hours power backups, and many other common facilities are available at Samriddhi, Rajarhat Kolkata Housing Apartments of G Group. There are several types of flats / accommodations are available at Samriddhi like 2-BHK, 3-BHK Rooms & Bunglow etc and the Samriddhi flat price at Rajarhat Kolkata are varies depending on the Flat Size. Finance and Bank Loan facility is available at Samriddhi Housing Project for the buyers. Those seeking flats around Rajarhat area of Kolkata should buy flats of Samriddhi Residential Complex of Rajarhat. The price of 1000 sq. ft. apartment is only 27 Lacs in Rajarhat. • G Group Head Office Address: - Narayani, 2nd Floor, CD-16, Salt Lake, Sector-1, Kolkata-64. • G Group Head Office Phone Contact Number: - 033-23372295 / 7439061987 / 7439406504 / 033-23372275. • G Group website: - www.ggroupofindustries.com. 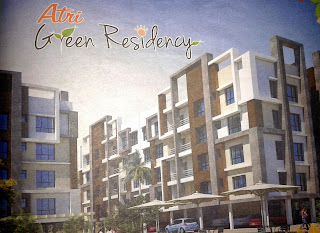 It is recommended to the peoples, who want to buy flats at Rajarhat Kolkata (or nearby areas like New Town, Salt Lake Sector-V, Rajarhat), to contact G Group as soon as possible to fill-out new flat booking forms of Samriddhi of Rajarhat Kolkata or to know whether any discount / offer is going on new Samriddhi flat prices.